Blanc de Bleu Cuvée Mousseux continues to gain popularity in the Wedding Community. Its delightful combination of taste, visual appeal and soothing color is what makes Blanc de Bleu the quintessential bubbly for the wedding toast. Its crystal-clear virgin glass bottle shows off the bubbly’s gemstone blue hue. This shade of blue symbolizes loyalty and faith, exactly how couples feel toward each other when they exchange their vows. When you combine its clear blue color with its classy label, Blanc de Bleu looks as stunning as the newly married couple ready to toast a new beginning. As sparkling wine continues to grow in popularity, Blanc de Bleu is also winning fans for its taste. Made with grapes grown in Northern California vineyards, known for their cool and clear breezes, Blanc de Bleu bubbly tickles the palate with a subtle hint of organic blueberry. Blanc de Bleu’s beautiful blue color is different from what you will see in any other sparkling wine. 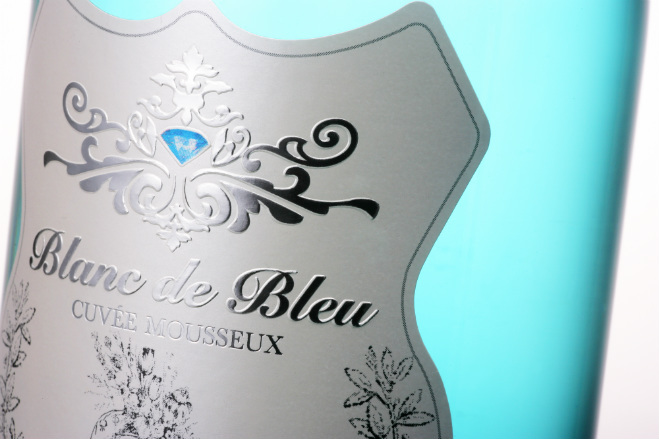 The vision behind creating Blanc de Bleu was to give people a reason to celebrate. Elegant packaging for this dry, crisp sparkling wine inside a striking bottle has captured the fascination of couples everywhere. You should not be surprised when you see Blanc de Bleu at the next wedding or big celebration you attend. “Every day, everywhere, someone is getting married. We want Blanc de Bleu to be the sparkling beverage of choice at all weddings,” says Fred Franzia, CEO of Bronco Wine Company, the worldwide producer and supplier of Blanc de Bleu. Who doesn’t love a cool glass of sangria on a hot summer’s day? I was recently at a nice summer barbecue, and of the, oh 10 people there, there were two couples getting married within the next two weeks!